Tickets for the 47th annual Oregon Bach Festival, which runs June 23 through July 10, went on sale Friday, April 1. Prices for ticketed concerts and events range from $20 to $65 and several ticket discount packages are available for almost all concerts. More than a dozen events are available free to the public. Tickets will be available online at http://oregonbachfestival.com/tickets or by phone at 541-682-5000. Tickets also can be purchased at the Hult Center box office at West Seventh Avenue and Willamette Street. Over the course of 18 days this summer, the festival is expected to attract more than 15,000 people from across the U.S. and overseas. This year’s event will feature more than 400 musicians and singers in 50 concerts, lectures, community events and world-class training workshops at four locations in downtown Eugene. This year’s festival highlights include Johann Sebastian Bach’s Mass in B Minor presented on period instruments; a world-premiere requiem by Sir James MacMillan, widely considered one of the world’s most successful composers; a high-energy concert by rising stars Punch Brothers; and composer and pianist Jeffrey Kahane performing Beethoven’s Piano Concerto No. 1 and conducting Gabriel’s Guide to the 48 States. In addition to Kahane, several audience favorites from past years are returning to festival stages this season, including organist Paul Jacobs, young tenor Nicholas Phan and violinist Monica Huggett. Rachel Podger, one of the world’s most accomplished violin interpreters of the baroque and classical periods, will make her festival debut. 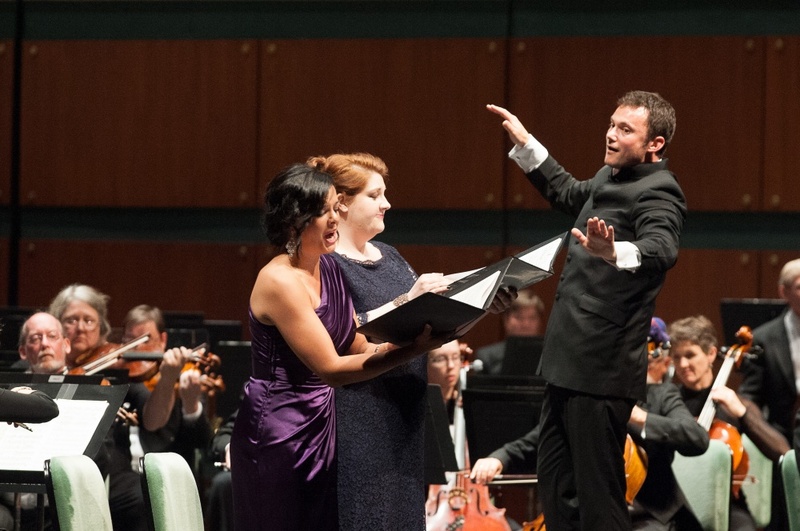 On Sunday, July 10, the Oregon Bach Festival will present a grand finale concert event in Silva Concert Hall, where more than 230 orchestra members, soloists and choral singers fill the stage for Brahms’ epic Ein Deutsches Requiem. Most performances and lectures will take place at the Hult Center for the Performing Arts’ Silva Concert Hall, Soreng Theater and The Studio. Several of the concerts featuring period instruments will be held in historic Beall Concert Hall at the School of Music and Dance on the UO campus. Finally, the festival’s organ concerts will be heard at Central Lutheran Church and First United Methodist Church. More information and a detailed program are available on the festival website.